Once you are confident with knitting patterns, you may want to resize a project. For example, you may want to size an adult hat knitting pattern down to a child's size or make a hat that's written for a baby for an older child. The good news is that most hat knitting patterns are relatively easy to resize. The only trick comes with intricate pattern stitches, cables, or colorwork that you might have to adjust to make the hat look right. Figure out the size you want. Multiply the stitches per inch by the inches required to get an approximate cast on number. Refine as needed to fit with the stitch pattern and the decrease pattern, or change the rate of decrease as needed. Decide how long you want your hat to be. Knit and enjoy your new hat. It's easier with simple patterns where the math isn't complicated. Your gauge is the number of stitches per inch you knit with your combination of needles and yarn. Multiply your gauge by the number of inches needed to get the number of stitches to cast on. First, take a look at an easy hat pattern and try to make it smaller. The figures from the scarf hat, a simple stockinette stitch hat with a garter stitch edge. This hat is intended to fit a teen or small woman, but what if you wanted to make one for a 5-year-old child? Sizing hats can be a bit tricky because everyone's head is a different size and grows at a different rate. You can use the charts at Bev's Country Cottage as a general guideline if you don't have the person you're knitting for nearby to measure. The chart tells us that a 5-year-old should have a head that's between 19 and 20 1/2 inches. Since that age group is 4 to 10, somewhere closer to 19 inches would probably work. Since hats are stretchy, you can knit a hat that's 1 1/2 inches smaller than the actual head circumference and it will still fit just fine. The chart also suggests the hat should be 8 1/2 inches deep. On this particular hat, you could go shorter than that because the scarf serves as earflaps (the teen sized hat is only 7 1/2 inches, for example). Now that you have your measurements, you should knit a gauge swatch to see how many stitches per inch you're getting with your chosen yarn and needles. Because you're basically rewriting the pattern, you can choose a yarn that gives you a different gauge and then adjust your math accordingly. For the sake of ease, though, let's assume you have five stitches in 1 inch, just like the pattern suggests. 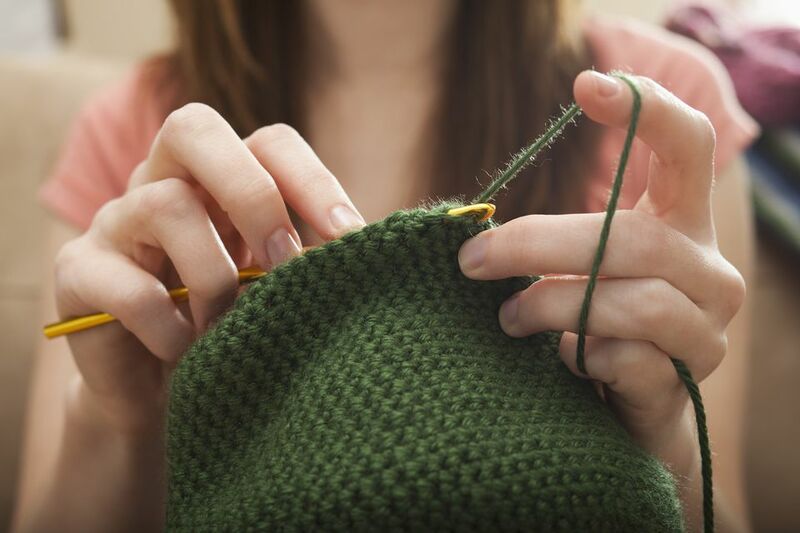 If you want to knit a hat that's 19 inches around, you will cast on 5 stitches per inch times 19 inches, for a total of 95 stitches. Does that number work for the rest of the pattern? Given that this hat is made of garter and stockinette stitches, it does. That's because neither of those stitch patterns relies on a certain multiple of stitches. The number also works with how the decreases are written. Decreases on the original pattern start with a knit 3, knit 2 together round, which requires multiples of 5 to come out evenly. Since 95 divides evenly by 5, this pattern will work with no changes other than to the number of stitches cast on and the length of the hat. You might have to add or subtract a couple of stitches to make a different pattern work. Working in the other direction uses pretty much the same method. This time look at the seed stitch baby hat and assume you want to knit it for a toddler, such as a 1-year-old child. Going back to the sizing chart, the circumference of a toddler's head can range from 18 to 20 inches. The finished hat can be 17 inches to allow it to stretch to fit. The chart also suggests 8 inches for the length. You would knit a gauge swatch. Using the example of 5 stitches per inch, you would multiply 5 stitches per inch by 17 inches to get 85 stitches needed. For both the ribbing and the seed stitch used in this pattern, we need a number of stitches that divides by 2, which 85 does not. You can either go up or down a stitch, though, and you'll be fine. Try 84 stitches. Looking at the shaping, in the first round the decreases shows a wide variety of decreasing options. You might want to get out your calculator and see what 84 divides evenly into. The answer is 4, so the easiest thing to do would be to skip that first round of decreases and start with a round of work 2, work 2 together (which takes up 4 stitches each time). It won't make a huge difference in the finished hat.